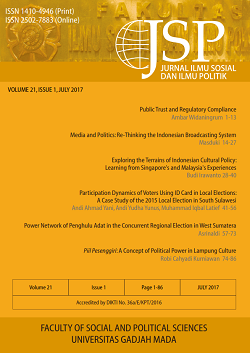 Jurnal Ilmu Sosial dan Ilmu Politik (JSP) is an open access, and peer-reviewed journal. Our main goal is to disseminate current and original articles from researchers and practitioners on various contemporary social and political issues: gender politics and identity, digital society and disruption, civil society movement, community welfare, social development, citizenship and public management, public policy innovation, international politics & security, media, information & literacy, politics, governance & democracy, radicalism and terrorism. JSP is published three times a year. It is nationally accredited by the Ministry of Research, Technology and Higher Education of the Republic of Indonesia (RISTEKDIKTI), No. 36/E/KPT/2016 (May 23, 2016). Since 2017, all articles have been published in English. Submissions are open year-round. Before submitting, please ensure that the manuscript is in accordance with JSP's focus and scope, written in English, and follows our author guidelines & manuscript template.